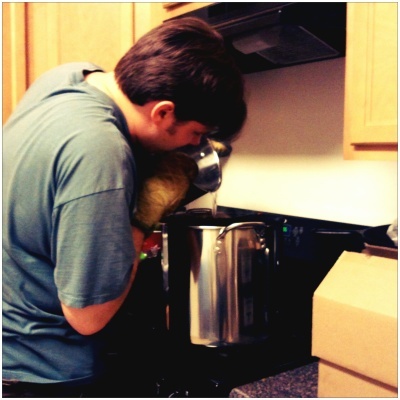 We have recently added another kitchen activity to our cooking list – we brewing our own beer. after taking so many tours of breweries around the area, we thought it would be fun to try it out ourselves. We’ve busy this month with 3 brews fermenting right now. Getting started with brewing wasn’t expensive and we discovered there are some great local and online resources to help us. The first thing we needed to get started with brewing was grabbing the supplies at an affordable price. We went to American Brew Masters, a local brew supply shop right here in Raleigh. They had some great deals that were lower than what we saw online and having people we could talk to in person to ask questions definitely made it a worthwhile trip. We decided to grab a deluxe brewing kit and added a second fermentor to it so we could both brew a batch. In addition to equipment that comes with this set up, we also got a second recipe kit so we both can make a batch that we love. We grabbed a Traditional Stout and a American Amber Ale. We already brewed the stout and we did smaller smaller batches of an Indian Pale Ale (IPA) and a Chesnut Brown Ale. The kits at American Brew Masters start at $80 and move up according to upgrades and additions. With everything that we got, the total came out to $230. Besides getting the basics and getting the extra bucket, we also wanted to get some equipment now rather than wait and upgrade. We plan on using this quite a bit. Is this cheap? No, but with every batch that we make the cost per use will decrease as we only need to get ingredients for our batches. We’re sanitizing and reusing old beer bottles for our brews. As the brews are bottled and tasted, I’ll share my reviews right here. We’d love to get your tips and stories if you have home-brewed in the past or are brewing now.